Dr Mike Short CBE , after 30 years in telecommunications with Telefonica, joined the Department for International Trade as the department’s first chief scientific adviser in December 2017. Mike leads the science and engineering profession in the department and ensures its policy is informed by the best science, engineering and technical advice. He advises on the technical aspects of future trade deals as DIT looks to create new arrangements following Brexit, and works with the UK’s research, development and academic communities to boost scientific and engineering exports. Mike has over 40 years’ experience in electronics and telecommunications and served as vice president of Telefonica, the parent company of the O2 mobile phone network, for 17 years to December 2016. In this post, he managed the launch of 2G (GSM) and 3G mobile technologies in the UK, and led research and development for Telefonica Europe. 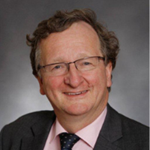 His career also includes the promotion of international technical standards in mobile technology, and he is also a former Chairman of the Global GSM Association, the UK Mobile Data Association, and president of the Institution of Engineering and Technology. He is currently a visiting professor at the universities of Surrey, Coventry, Leeds, Lancaster and Salford, where in recent years he has led the development on collaborations in areas such as smart cities, digital healthcare, cybersecurity and driverless vehicles. He was honoured with a CBE in 2012 for his services to the mobile industry.